Amount of malware multiplies each year and business is booming for antivirus companies. However it is bit hard to sell someone a product before virus strikes. And when virus strikes panicking user needs fast solution. Going shopping for big fancy expensive box with antivirus is slow. So companies started releasing free scanners – simplified and free versions of their products intended as quick solutions, carrying big "and now buy ” links. 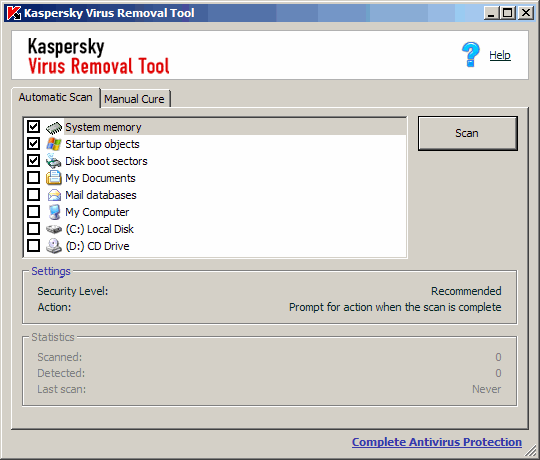 I’ve previously covered two good scanners – CureIt and ClamWin , now it is similar product from Kaspersky Lab. User downloads executable with latest virus database built-in. Performs scan of his PC, cleans viruses, gets happy. However when software only has single task to accomplish – difference in usability really starts to shine. Download is relatively large at ~30Mb. I got suspicious when I saw that file name start with setup . Bingo – instead of getting to that scanning executable performed installation (complex one judging by Process Explorer activity) to the folder on desktop. install can fail when using Windows LiveCD solutions. After that it was ready for scan with simple interface and few areas (that must be scanned first) checked. After scan tool offered to uninstall itself. I refused – to look into what exactly was installed and how portable is it. Turned out that folder cannot be deleted without uninstall and reboot (even with Unlocker ) meaning it’s locked at deep level. Launch process is handled by complex shortcut with full paths to two different executables. Kaspersky does claim having one of the best and rapidly updating virus databases. Being able to download free and fully functional scanner of commercial product is always good option. However while others are trying to simplify process and make their free tools portable and flexible – Kaspersky is offering small monster. Heavy, complex and completely not portable . Official site lists it as unsupported by Kaspersky Lab, pointing users to forum. Shame on me, I’m not using any virus removal tool. I was using AVG a while ago, but somehow I stopped using it after a drive format. I don’t know if you have used AVG in the past, but if so how do you think it compares? This one is not fully functional antivirus (with background monitor and daily updates), it’s only a scanner for quick fix if you know system is or might be infected. I hardly catch any viruses myself so more interest in tools that help clean existing mess on other PCs than prevent it. For Internet connected PCs I’d say good firewall might be more important and useful then antivirus. Assuming person isn’t clicking everything looking for trouble. Need to do a post on firewall.